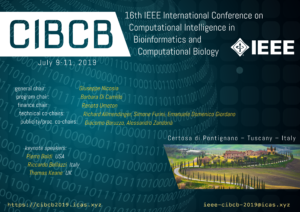 This conference will bring together top researchers, practitioners, and students from around the world to discuss the latest advances in the field of computational intelligence and its application to real world problems in biology, bioinformatics, computational biology, systems biology, synthetic biology, biomedicine, chemical informatics, bioengineering and related fields. After the conference, prospective authors are invited to submit manuscripts to a Special Issue in “Deep Learning for Genomics/Bioinformatics” to be published in IEEE/ACM Transactions on Computational Biology and Bioinformatics. All works presented at the event and related to other topics will be invited to submit for a Special Issue on IEEE Journal of Biomedical and Health Informatics. The Special Issue is open to anyone, i.e. having an accepted paper at CIBCB 2019 is not a requirement. Papers accepted at CIBCB 2019 need to be extended significantly before being submitted to the Special Issue. Dec 6, 2018 — The Call-for-Papers of IEEE CIBCB 2019 is now available.